"James McCourt is an ecstatic fabulist, robustly funny and inventive, and touchingly in love with his subject." 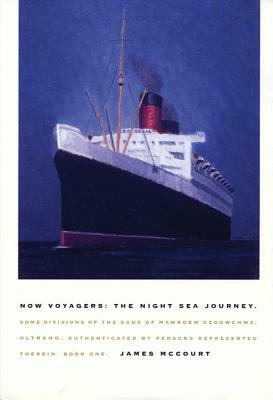 --"Newsweek"
"Now Voyagers" is the long-awaited sequel to James McCourt's first novel, the comic masterpiece "Mawrdew Czgowchwz" (pronounced "mardu gorgeous"). About James McCourt and his earlier work, Susan Sontag wrote, "Bravo, James McCourt, a literary countertenor in the exacting tradition of Firbank and Nabakov, who makes his daringly self-assured debut with this intelligent and very funny book." James McCourt is the author of "Queer Street," a "Publishers Weekly" Best Book of 2003. He is the author of three novels and two short story collections and has contributed to "The Yale Review," "The New Yorker," and "The Paris Review." Description: This is an ARC/Review/Proof copy for limited distribution to the trade. New, unread book in near fine condition; the only blemish being a slight crease to lower back cover. Wrapped in mylar to protect covers.